The four elements are Earth, Air, Fire and Water. These elements form an ancient system of relationships and transformations believed to be at the root of our universe. For example, the four elements embody the known states of matter: solid (Earth), liquid (Water), gas (Air), and plasma (Fire). Body, Heart, Mind, and Spirit also correlate directly to Earth, Water, Air, and Fire. Mystical wisdom holds that the material world and its fundamental powers are all derived from these four elements. Conversely, everything can be broken back down into one of the four elements. Since each of the four elements relates to a tangible aspect of being, the elements support, facilitate, and stimulate our personal and spiritual growth. Seeing the world through a system with only 4 elements lets us intuitively navigate life. The Transformation Oracle is color-coded so you can see at a glance which element plays into the answer to your question—and which aspect of being is involved. The colorful orange border around this card indicates its element: FIRE. There are 44 cards in the Transformation Oracle. Each card has original artwork with profound symbolic meaning, as well as a word. The EARTH element cards are brown. 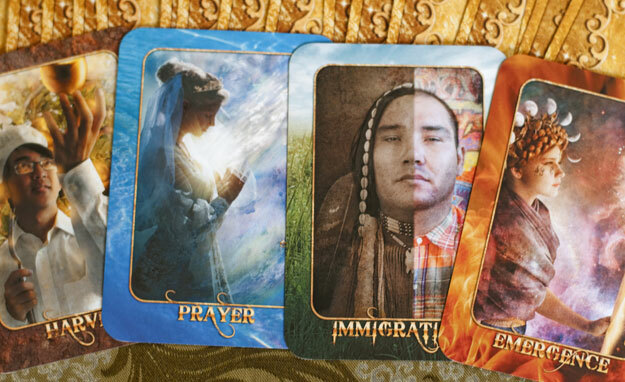 Earth cards correspond to the physical realm of our body, home, and material possessions. The WATER element cards are blue. Water cards correspond to the emotional realm of the heart, our feelings, passions, faith, and intuition. The AIR element cards are green. Air cards correspond to the abstract realm of the mind, our thoughts, life philosophy, and ideas. The FIRE element cards are orange. 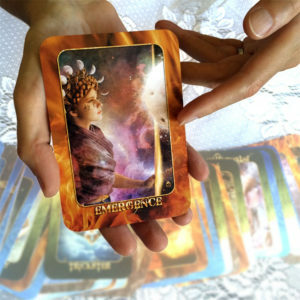 Fire cards correspond to the spiritual realm, the activating principle, life force, and consciousness. The Transformation Oracle uses the four elements and four aspects of being to reveal metaphysical secrets about life. By letting yourself “travel” into the artwork and respond to its visual messages, you will receive a good deal of practical AND other-worldly insight into your issue. The Oracle’s simplicity makes it accessible, fun, and empowering because it draws on understanding people may not realize they already have! "I gave my daughter a set of Transformation cards during a recent visit. She did her past, present, future reading, and she was amazed at how right on they were at this stage in her life. Thank you for doing this. You are truly a goddess with an amazing gift for helping so many people!" WORKSHOP I in the Certification Course covers the Four Elements and how to read them in spreads.